Graduating from middle school, high school, college or reaching other educational goals are important milestones that call for a major celebration! It is time to reflect on all hard work put into that achievement and celebrate a new graduate. It is a “hard-earned” event that needs to be fun and relaxing for the graduate and the guests. Usually, family members and party planners organize graduation parties for new graduates. To help you better organise a graduation party that maybe on a horizon for your family, we have compiled a list of popular themes and ideas. The goal is to have a fabulous time with unique personalized and memorable touches and keepsakes that will make guests cherish those memories for a long time. The decor of the party should reflect the mood of the graduation and often families use school colors as their theme colors. Popular graduation party themes can be: Road to Success; Keys to Success; Life is an Adventure; or Hawaiian theme as examples. At our aviation-centered event venue, aviation party themes are very fitting for graduation events, so you can let your creativity run wild with various topics of: Soaring to Success; Fly High; Spreading Your Wings, etc. It is easy to play around this theme and images for invitations and décor and you can use our party book for some ideas. Of course streamers, confetti, balloons, flowers and banners are used in abundance and add to the festive atmosphere of the event. We can also provide our vintage airplanes for displays, backdrop and photo opportunities! Use pre-designed or personalized graduation invitation cards in your school colors, theme and style for your guests. For aviation parties, you can make 3D paper airplane invites. In addition, some set up an Event Facebook page with all essential information to allow your guests to RSVP for the graduation party and get the important details online. There are many vendors that can set up a mobile pop-up bar at your event and serve delicious appetizers or desserts. Various bars do very well at informal parties and especially at graduation parties. You can offer a gourmet popcorn bar with different flavors and toppings. Fun presentation and delicious new flavors will be the talk of the party. Setting up a candy bar or a cookie bar is very popular. Often, these desserts can be customized to the theme of the event. A gourmet fruit popsicle or ice-cream bar is a great dessert option for summer. Easy to handle, delicious bite-sized snacks and desserts with creative twist will win your guests over. There’s hardly a party nowadays without a photo-booth, which work great for graduation parties. New graduates will love creating hilarious photos at the photo booth with all the fun graduation themed props. Those photos will likely be some of the best keepsakes from the event. You can also arrange for a karaoke contest, or a DJ to immerse the venue with music and clear a dance floor for everyone to get their groove on. Additionally, you can create a short video honoring the new graduate, and play it at the graduation event. yearbook photos is by attaching them to colorful balloons or clipping them to clotheslines. You can also have inspirational quotes written on chalkboards around the party. Instead of a traditional guest book, you can invite guests sign Jenga blocks or wooden airplanes going along with aviation theme. 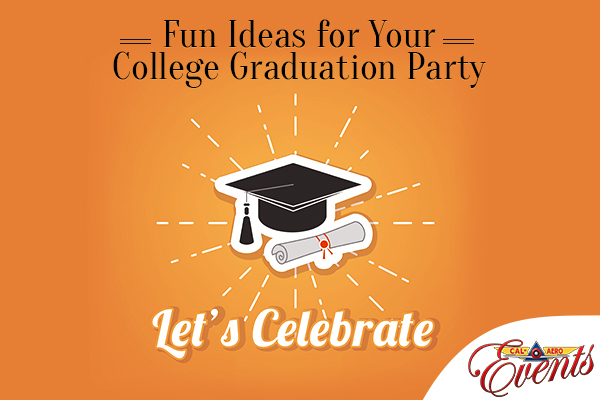 Get crafty and creative to design a graduation party of your dreams. Our party planner can assist you with many ideas and implementation.